Paiute is a card game for two to five players, originating in Hawaii. As in Knock Poker, players work to improve their hand by drawing cards from the stock and discarding unwanted cards until they are satisfied with their hand. However, Paiute allows for six-card hands, which makes some of the hand rankings notably different from those in poker. The object of Paiute is to be the player with the best combination of cards at the end of the hand. Paiute uses one standard 52-card deck of playing cards. We sure would appreciate it if you used a deck of Denexa 100% Plastic Playing Cards for your game. Paiute can be played just for fun or as a low-stakes betting game. Players should come to a mutual agreement as to whether or not betting should take place, and if so how much the ante should be. All players then ante the agreed-upon amount. Shuffle and deal five cards to each player. Then, deal one card, face up, to the center of the table. All cards of this rank are wild for the remainder of the hand. Place the deck stub, face down, so that it partially covers this card, thereby forming the stock. Turn one more card face-up and place it next to the stock; this card forms the discard pile. Game play begins with the player to the dealer’s left. This player draws one card from either the stock or the discard pile, then discards one card to the discard pile. At the end of your turn, the discard pile must always have a different card on top of it than the one that was there at the start of it. You cannot draw a card from the discard pile and then discard it on the same turn. If the stock should run out before the end of the hand, set aside the top card of the discard pile, shuffle it, and turn it face down to form the new stock. (The top card of the discard pile remains face-up in the discards, keeping it available to be drawn. Five of a kind consists of all four of a particular rank of card, plus a wild card (example: 9-9-9-9-2 if 2s are wild). Ties are broken by the rank of the cards (five nines beats five eights). A royal flush consists of A-K-Q-J-10 of the same suit. Competing royal flushes tie. A straight flush consists of five cards of the same suit in sequence (example: 4-5-6-7-8♠). Ties are broken by the highest card; competing straight flushes with the same top card tie. 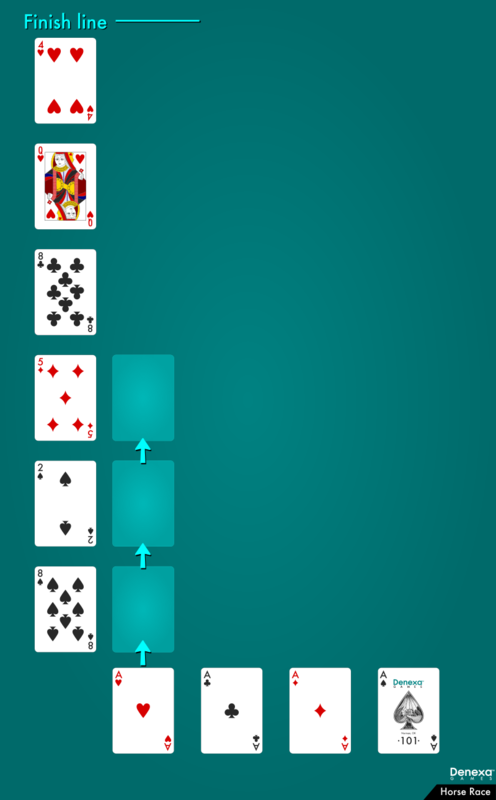 A six-card hand containing four cards of one rank and two cards of another rank (example 8-8-8-8-4-4). Ties are broken by the rank of the four-of-a-kind. Two three-of-a-kinds (example 7-7-7-3-3-3). Ties are broken by the rank of the higher three-of-a-kind. Three pairs (example Q-Q-10-10-6-6). Ties are broken by the rank of the highest pair, then the middle pair if there is a tie, then the lowest pair, if necessary. A paiute may only be called on the player’s first turn. It bears mentioning that the traditional poker hands of flushes and straights are not considered winning combinations in Paiute. The player or players who called with the highest winning combination win the game. If playing for money, the winner takes the pot (which is split if multiple players tie for highest hand). Bacon is a simple trick-taking game for four players, in partnerships, that functions a lot like a simplified version of Euchre. Bacon originated in the United States in the early twentieth century. It makes an excellent introduction to the mechanics of trick-taking games, and especially those with trumps, for those who are unfamiliar with them. The object of Bacon is to be the first partnership to reach ten points by collecting more tricks than the opponents. Bacon uses a standard 52-card deck of playing cards. You could use any deck of cards…but choosing Denexa 100% Plastic Playing Cards makes your game that much more special. You will also need something to keep score with, such as pencil and paper. Players should determine who their partner is, either by mutual agreement or by some randomly-determined method. Players on the same partnership are seated across from one another, so that proceeding around the table in turn order, the partnerships alternate. Shuffle and deal five cards face-down to each player, then one additional card, the upcard, face-up to the center of the table. The deck stub is set aside and, in most cases, takes no further part in game play. Game play begins with the auction, which determines the trump suit, although it is not technically an auction in the strictest sense of the term. The player to the left of the dealer has the first chance at accepting the suit of the upcard as the trump suit. They may select this suit as trump by stating “pick it up”, or decline to do so by saying “pass”. If the player passes, the next player to the left is offered the same options, and so on around to the dealer. Should the dealer pass, the upcard is discarded and a new upcard is drawn from the deck stub and the process repeats. If the fourth upcard is passed on by all four players, the hand is considered acquitted, the cards are thrown in, and a new hand is dealt by the same dealer. When a player chooses to pick up a trump, they have the option to “go alone”. By doing so, the player is venturing that they will be able to win the majority of the tricks with their partner sitting out of the hand. 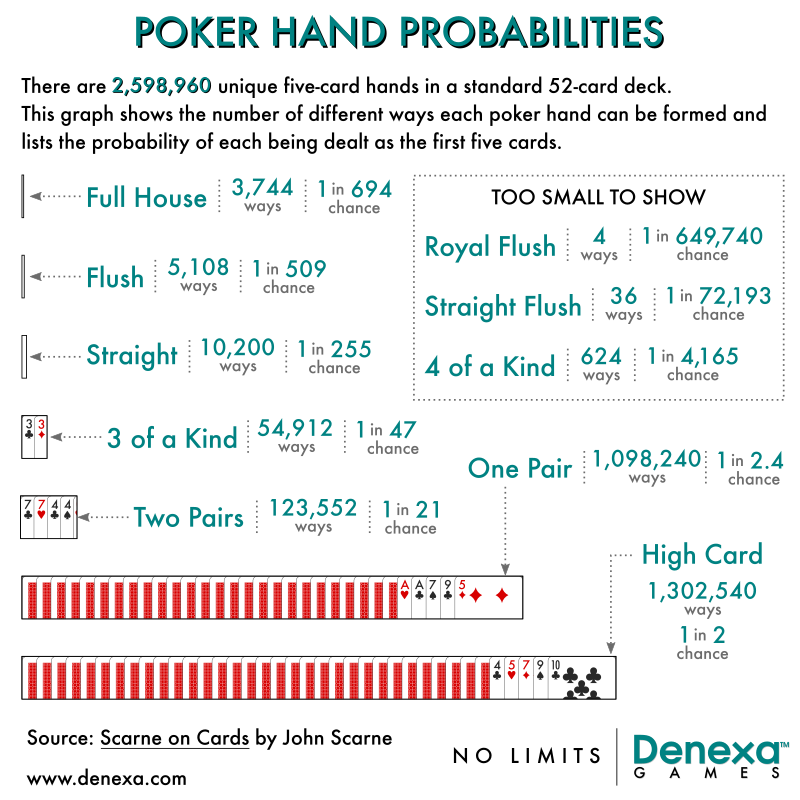 If they are successful, their score for the hand will be doubled (see “Scoring” below). Of course, winning with only one partner will be more difficult, so this should be kept in mind before making the decision to go alone. When a player picks up a trump or declares themselves a loner, their partner has veto power over each of these decisions. The veto is binding and results in the same effect as if the player passed, if they vetoed the pick-up, or if they never made the declaration to go alone. In practice, the veto is rarely exercised, but it can be an important option in situations where a player has reason to believe that their partner is greatly overestimating the strength of either of the partners’ hands. The partnership that chose the trump suit is called the declarers, and their opponents the defenders. If there is only one declarer, because they decided to go alone, they are simply called the loner. Game play begins with the player to the left of the declarer who called “pick it up” taking the upcard into their hand and then discarding any card face-up. This player then leads to first trick. Turn order proceeds to the left, with each person playing a card of the same suit as the card led, if able; otherwise, they may play any card. When all four players have had a chance to play, the highest card of the suit led wins the trick, unless a card of the trump suit was played, in which case the highest trump wins the trick. The cards in the trick are collected by the player who won them. Captured tricks are not added to the hand, but are kept face-down in a captured-tricks pile. Because the number of tricks captured is important to the outcome of the game, they should be kept separated somehow. Placing tricks at right angles to one another works well for this purpose. This process repeats until five tricks are played and all players have depleted their hands. Winning three or four tricks over the course of a hand is worth one point, and winning all five tricks is worth two points. These scores are doubled if they were achieved by a loner or the defenders (for a total of two points for three or four tricks and four points for a shutout). Game play continues until one partnership reaches ten points. That partnership is the winner. Preference is the name applied to an entire family of games played from central and eastern Europe into Russia. There are dozens of regional variations of the game, so the one we’ve chosen to describe here is the version played in Austria. Other variants add new elements to play, such as bids to collect more than six tricks. Preference is a game for three players. If a fourth person wishes to play, they can be included by simply sitting out on their turn to deal. While Preference can be played with pencil-and-paper scoring, traditionally it is played for cash (not even chips, as many betting games are). The object of Preference is to collect six tricks if you are the declarer and two if you are a defender. 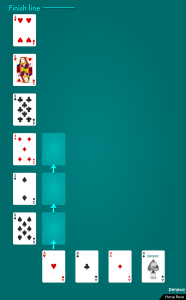 Preference uses a special 32-card pack. Starting from a deck of Denexa 100% Plastic Playing Cards, remove all of the 2s through 6s, leaving aces through 7s in each of the four suits. Before playing, it should be established whether the game is being played for money or for points. If played for money, the players should mutually agree to the value of one stake. This will be the denomination that all bets will be transacted in. Players should also agree as to the amount that will be anted to seed the pot for the first hand. This ante must be divisible by ten times the stake. Deal a packet of three cards face down to each player. Deal two cards face down to the center of the table. This forms the talon. Deal a packet of four cards face down to each player. Suits in Preference rank in the following order, from highest to lowest: hearts (4), diamonds (3), clubs (2), spades (1). Note that this suit ranking is relevant to the bidding only and not to the value of the suits in the actual game play. One. A bid that the player will take six tricks if they are allowed to name the trump suit and exchange the two cards from the talon with two from their hand. Game. A bid that the player will take six tricks if they are allowed to name the trump suit without using the talon. Hearts. A bid that the player will take six tricks if hearts are trump, without using the talon. A player may also pass, which means they take no further part in bidding that round. If “one” has been bid, it may be overcalled by “two”, then “three”, and so forth. A player may not skip numbers in bidding. If game has been bid, the only bids available are game and hearts. Once a player has made a numerical bid, they may not increase it to game or hearts; they may only bid higher numbers. A bid of hearts cannot be overcalled; the auction immediately ends. Otherwise, the auction ends when all players but one have passed, or all of the players have either passed or bid game. Numerical bid: The declarer collects the two cards from the talon and discards two cards from their hand, face down. (They may of course discard the two cards from the talon, if desired.) The declarer then announces the trump suit for the hand. It must be at least as high as the winning bid (e.g. if the winning bid was Three, the only possible trump suits are hearts  and diamonds ). Game: If only one player bid game, that player becomes the declarer. If multiple players bid game, they each declare the suit they desire as trumps, and the highest-ranking suit wins. If multiple players desire the same trump suit, the first one to the dealer’s left wins. This player becomes the declarer and their preferred suit becomes trump. The talon is discarded. Hearts: The player who bid hearts is the declarer. The talon is discarded. The two players who did not become the declarer become the defenders. With the trump suit having been declared, the defenders decide whether they wish to play the hand, and thus commit to winning at least two tricks, or drop out. The defender on the declarer’s left announces whether they are playing or not first. If both of the defenders drop out, the hand is not played, and is paid out as though the declarer took all ten tricks. If one defender plays but the other does not, they have the option to invite their fellow defender to play. “Invite” is kind of a misnomer—the invited player, called the guest, is compelled to play, at the inviting defender, or host‘s, insistence! However, the host takes on all risk of the defenders’ failure to take a total of four tricks. If the declarer has no aces, they may (but are not required to) declare this before leading to the first trick. Note that they cannot discard aces into the talon in order to make this declaration. This declaration allows them to receive a bonus if they successfully take six tricks, but pay a penalty if they do not (see “Payouts and penalties” below). The declarer leads to the first trick. If able to follow suit, a player must do so. If they are unable to, they must play a trump, if able; otherwise, they may play any card. The trick is won by the highest card of the suit led, unless a trump is present, in which case the highest trump wins the trick. Also, a special rule comes into play if both defenders are playing and the declarer leads. If the first defender to play can beat the declarer’s lead, they must do so by playing the lowest card they can that will beat the lead (subject to the other rules above, of course). After all ten tricks have been played, each player counts the number of tricks they captured throughout the game. The declarer takes ten times the stake from the pot and distributes one stake to each of the defenders for each trick they took. (If one of the defenders was invited to play, then the host defender receives the payout for both of the defenders.) The declarer then takes the remainder, which constitutes one stake for each of the tricks the declarer took. After the payout occurs, penalties are assessed. if the declarer failed to take six tricks, they pay twenty times the stake to the pot. If any of the defenders who chose to play failed to take two tricks, they pay ten times the stake to the pot. If one of the defenders was invited to play and the two defenders failed to take a total of four tricks between the two of them, the host defender is solely responsible for paying the ten units to the pot. The following bonuses are then paid. Note that these bonuses affect all players, whether or not they played, dropped out, or were invited in. If the declarer bid hearts and took six tricks, each opponent pays ten times the stake to them. If they failed, they pay ten times the stake to each opponent. If the declarer held all four aces and took six tricks, each opponent pays ten times the stake to them. If the declarer declared “no aces” and took six tricks, each opponent pays ten times the stake to them. If they failed, they pay ten times the stake to each opponent. Game play continues until the pot is depleted. At this point, the players mutually decide whether to end the game or ante anew to continue playing. Horse Race is exactly what it says in the name—a simulated horse race, done with cards. Whichever player bets on the winning suit wins their bet. The object of Horse Race is to win money by successfully predicting which of the four suits will win a race. 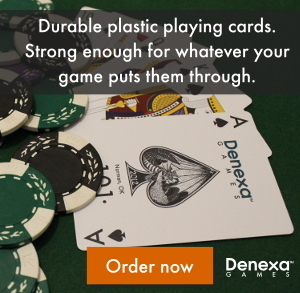 To play a game of Horse Race, you’ll need one standard 52-card deck of playing cards, like Denexa 100% Plastic Playing Cards. You will also need chips or something similar for players to bet with. One player should be selected as dealer and banker. The banker will be responsible for paying out the winners, so they are entitled to set the minimum and maximum limits on betting according to their ability to cover the bets. Remove the four aces from the deck and place them in a horizontal line. Deal six cards from the deck in a vertical line, perpendicular to the four aces. The rest of the deck becomes the stock. The banker and players look at the six cards in the layout. The more times a suit appears in the layout, the fewer times it appears in the rest of the deck, and therefore the less likely it is to win. The banker announces the odds that will be paid on a winning bet on each suit. These odds may be whatever the banker feels is appropriate; however, it should be noted that if they are not reasonably fair, they simply won’t get any bets. Some guidance on quoting odds: the less likely a suit is to win, the higher the possible payout should be. If the four suits are close to equally represented in the layout, the suits should all pay even money. For more information on this topic, the Wikipedia article on mathematics of bookmaking may be helpful. Once the odds have been quoted, the players place their bets on whichever suit they want by putting their bets below the ace of the appropriate suit. Care should be taken to ensure that different players’ bets remain separate and identifiable. When all players who wish to bet have done so, the race begins! The banker begins dealing cards, one at a time, from the stock. As each card is dealt, the ace of the same suit is advanced one space toward the end of the line (using the cards in the layout as guides). The banker continues drawing cards until one ace crosses the finish line (i.e. seven cards of that suit have been dealt). The bets on that ace are then paid out according to the previously determined payout amount, and the bets on the other three aces are collected by the banker. If you’re playing for a while, it’s probably a good idea to have the bank rotate between players every few hands or so. Faro is a gambling game that was hugely popular in the United States in the nineteenth and early twentieth century, especially in the Old West. Faro’s popularity was due to the fact that not only is it easy to learn, it has a very low house edge compared to other games like Blackjack. Unfortunately, that low rate of return for the house led many unscrupulous dealers to cheat. Crooked dealing boxes and stacked decks were common in the days of Faro. Faro is closely related to Basset, a game that was played in France up to 1691, when it was banned. Faro arose as a legal alternative until it too was banned, although it spread to England and from there to the United States, where it continued to remain legal. Faro remained popular in the United States until around World War I, and it continued to be dealt in some Nevada casinos until 1985. The object of Faro is to win money by successfully predicting which cards will be dealt as “winning” cards. Faro requires one standard 52-card deck of playing cards. 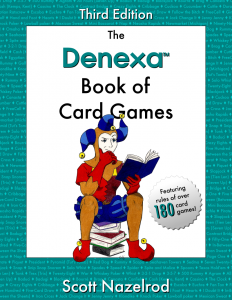 While plastic playing cards weren’t invented until long after Faro lapsed into obscurity, there’s no reason that you can’t use Denexa 100% Plastic Playing Cards in a modern Faro game. You will also need a dealing box, or shoe, as well as a Faro layout. A Faro layout consists of thirteen cards, one of each rank. Traditionally, the cards displayed are the thirteen spades, but there’s no reason any other suit couldn’t be used. In Faro’s heyday, the layout was often simply thirteen cards from another deck glued to a board, but fancier establishments did use layouts printed on felt. A abacus-like device called a casekeeper was used to keep track of which cards had already been dealt, but a pencil and paper can easily substitute for it. Finally, you need something for players to bet with, i.e. chips. Rather than using a standard denominational color scheme, Faro is usually dealt with differently-colored chips for each player, as in Roulette, to ensure that different players’ bets are not confused. You’ll also need coppers, which are small lammers used to “copper a bet” (see below). Faro coppers were, in more formal games, small black hexagonal chips; in less formal ones, pennies were common. The dealer is permitted to declare the maximum and minimum betting limits, which they may change at any time depending on how much money they are willing to risk. Shuffle the deck and allow one player to cut it. Place the deck in the shoe and discard one card, turning it face up. This card, called the soda card, has no bearing on game play. Red chip: A bet in this position bets only the card covered, in this case the 9. White chip: A bet in this position covers the two cards the chip is between, in this case the jack and 3 for one chip and the 3 and 4 for the other. Green chip: A bet in this position (i.e. the outside corner of a card) covers the card it is touching and the card second card in the direction of the chip; that is, it skips one card. In this case, the green chip is covering the queen and 10. Black chip: A bet in this position (i.e. the inside corner of a card) covers the card it is touching, the one above it, and the one next to it. In this case, the 10, 4, and 9 are covered. Purple chip: A bet in this position covers the four cards surrounding it, in this case the 5, 6, 8, and 9. Yellow chip: A bet in this position is betting that the card that wins on the next turn will be even. Orange chip: A bet in this position is betting that card that wins on the next turn will be odd. Blue chip: A bet in this position is betting that the card that wins on the next turn will be higher than the card that loses. Yellow-green chip: A bet in this position covers the card it is closest to and the card diagonal to it, in this case the 3 and the 10. By default, all bets are bets that the card or cards wagered on will win. If the player instead wishes to bet that the card or cards will lose, they place a copper on the bet. Once players have had an adequate amount of time to bet, the dealer draws two cards from the shoe (this pair of cards is called a turn). The first card drawn is the banker’s card, which is placed to the right of the shoe, and the second is the player’s card, which is placed to the left of the shoe. The banker’s card is considered a loss, and any money wagered on the card of the same rank on the layout is removed from the layout and placed in the bank. Likewise, the player’s card is considered to have won, and any money wagered on that rank of card is paid out from the bank at even money. (If any of the relevant bets have been coppered, they are, of course, paid out if the card lost and collected by the bank if the card won.) Multiple-card bets win or lose if any of the covered cards win or lose. Any bets on cards other than the two dealt on the turn remain on the layout, neither winning nor losing. The two cards are then marked as having been played (and whether they won or lost) on the casekeeper. If the two cards dealt are of the same rank, this is called a split. When a split is dealt, the banker collects half of the money wagered on that rank. After each turn, players may change their bets. Play continues in this manner until all there are only three cards remaining (one last banker/player pair and an unmatched card, called the hoc card). Players then bet on the exact order that the cards will be dealt, which is called calling the turn. If the order is successfully predicted, the wager is paid out at 4 to 1. If the last three cards include a pair and an unmatched card, it is called a cat-hop and winning bets are paid out at 2 to 1. If the last three cards are three of a kind, no bet on the last three cards takes place. Bets calling the turn are placed on the edge of the losing card facing the winning card. The bet is heeled in such a way that it tilts toward the winning card. If there would be ambiguity because the third card (the one the player is calling as the hoc card) is between the desired winning and losing cards, the bet is heeled toward the outside edge of the layout to signify that the bet goes “around” the hoc card. After the last turn and hoc card are dealt, the deck is shuffled and returned to the shoe, the next soda card is dealt, and the game resumes. Old Maid is a classic children’s game, relying on little more than pure luck. It is suitable for two to ten players. The object of Old Maid is to avoid being the player left with the unmatched queen. To play Old Maid, you’ll need a standard 52-card deck of playing cards, like Denexa 100% Plastic Playing Cards, with one of the queens removed. Shuffle and deal the entire deck out as evenly as it will go. Some players will have more cards than others, which is perfectly all right. Players start by looking at their hands, finding any pairs, and discarding them to a central discard pile. Play begins with dealer fanning their cards out so that the backs of them are facing the player to their left. That player draws a card from the dealer’s hand. If it forms a new pair with one of the cards already in the player’s hand, they discard the pair. They then allow the player to their left to draw a card, and so on. Eventually, two of the three queens will be paired and discarded, and the third queen will stand alone, unable to be matched. This queen is referred to as the Old Maid. The primary interest in the game then becomes the whereabouts and circulation of the Old Maid; the player that holds it wants to encourage the player next to them to draw it. Players may do whatever they think will be effective in convincing them to draw the Old Maid, short of outright exposing cards or refusing to allow the player to take the selected card from their hand. As players pair up their cards and discard them, they will gradually run out of cards, until they have completely exhausted their hand. Players who have run out of cards sit out and take no further part in game play. Eventually, all the players will have dropped out but one, who is holding the Old Maid; this player is the loser. Gops (also known as Goofspiel) is a rare example of a card game where luck doesn’t factor into the game play at all, owing to the fact that each player’s hand begins with exactly the same cards. In fact, the name Gops is said to derive from “Game of Pure Strategy”. It can be played with two or three players, or more if multiple decks are used. Gops was invented at Princeton in the 1930s. Its complete lack of luck has led to it being studied to find the mathematically perfect strategy. The object of Gops is to win the most prize cards. Gops with up to three players is played with a standard 52-card deck of playing cards, like Denexa 100% Plastic Playing Cards. Unlike most games, the cards are not shuffled and dealt; instead, the deck is separated into its four suits. The diamond suit is set aside to serve as the prize cards, and each player is given all thirteen cards from one of the other three suits. If playing with more than three players, hand out the hearts, spades, and clubs from a second deck. The diamond suit from the second deck is set aside and takes no part in game play. Each player takes their suit and arranges it in such a way that its order in their hand is not obvious to the other players. The prize pile is shuffled and placed face-down in the center of the table. Any player turns up the top card of the prize card pile. Each player then looks at it and places a bid for the prize card by taking one card from their hand and placing it face-down in front of them. After all players have bid, the bid cards are turned face up, and the player who placed the highest bid wins the prize card, keeping it in a face-up won-cards pile in front of them. Cards rank in the conventional order, with aces low (A, 2, 3, … J, Q, K). In the event of a tie, the prize card is not awarded to any player and discarded. After bidding is resolved, all of the bid cards are discarded. Game play continues until all thirteen prize cards have been bid on. Each player then totals the value of their won prize cards. 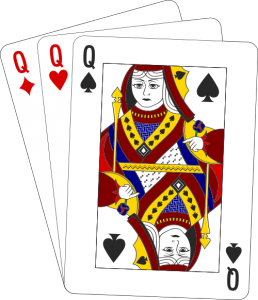 Aces are worth one point, jacks eleven, queens twelve, kings thirteen, and all other cards their face value. The winner of the game is the player with the highest point total.